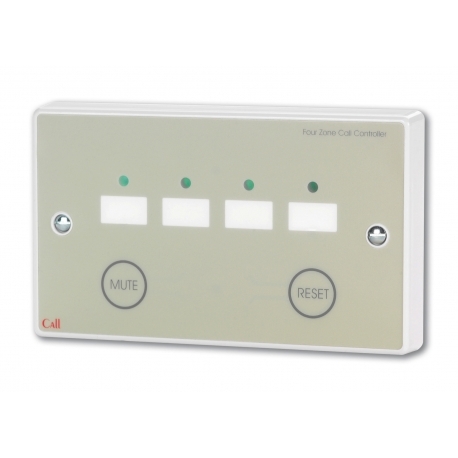 An attractively-designed four zone call controller c/w mute and reset buttons. 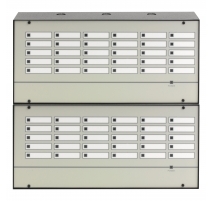 Fully compatible with C-TEC's entire range of 800 Series Call System components. Capable of indicating standard (constant tone) and emergency (intermittent tone) calls. Requires a separate NC930 12V 250mA PSU. 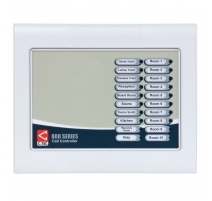 Includes four zonal alarm LEDs, RESET and MUTE buttons. Two open collector outputs (Emergency and Aux Out). Up to two NC944s can be connected to one NC930 PSU to create a mini-call system of up to 8 zones. Mounts on a standard 25mm UK double gang back box. 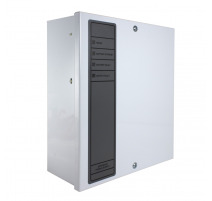 Mains supply Requires a separate NC930 12V 250mA PSU. Max battery size and type Optional NC941B battery back up kit available for use with the NC930 12V 250mA PSU. 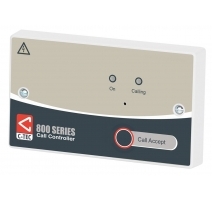 Alarm current Determined by the number/type of field devices connected to the call controller/system. Open collector outputs EMERG OUT (goes to 0V on any active Emergency call to drive external indicators such as overdoor lights/sounders). Max. sink current 20mA); 4 x AUX OUT (go +12V steady when the relevant zone is in Standard call or pulse at +12V for an Emergency call). 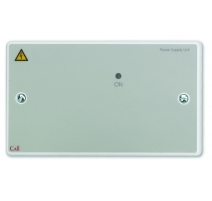 Indicators 4 x red Zonal Alarm LEDs (lit steady for a Standard call, pulse for an Emergency call); Internal buzzer (on steady for any Standard call, intermittent for any Emergency call). Controls Disable Mute; Disable Reset. Call acknowledgement functionality No. If required use an NC910 or NC920 10 or 20 Zone Call Controller instead. Product dimensions (mm) 146 W x 87 H x 21 D mm. Mounts on a standard 25mm UK double gang back box. Notes If a standard call and emergency call are both present on different zones and both of these zones have their respective AUX OUT enable links fitted, the AUX OUT terminal goes to +12V steady and will not pulse until the standard call is cancelled. 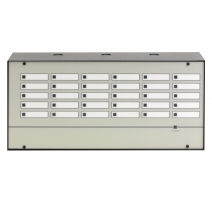 Product Dimensions: 147 W x 87 H x 39 D mm. Mounts on a 25mm UK double gang back box. 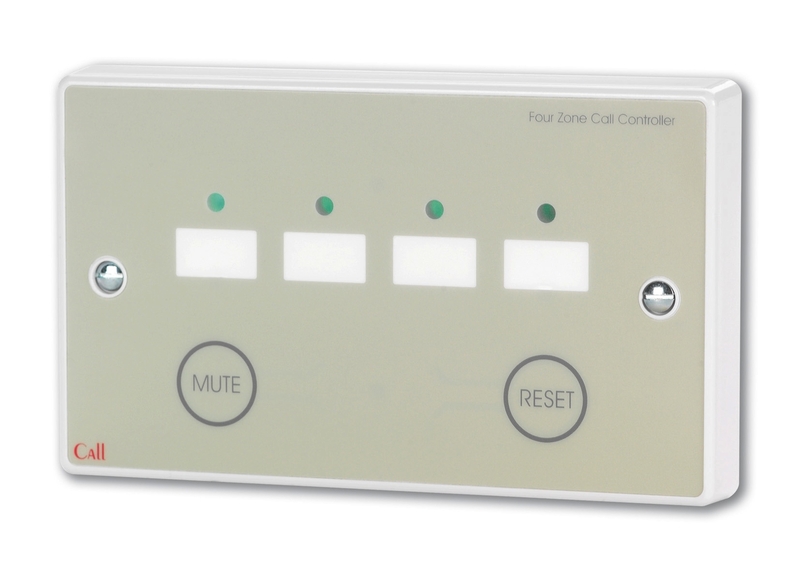 The NC944 Four Zone Call Controller is compatible with all 800 Series call points, ceiling pulls, infrared ceiling receivers, monitoring points, overdoor lights and remote sounders. 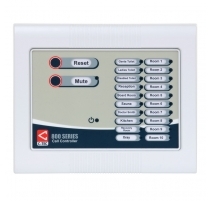 Depending on how the Controller is configured and the devices connected to it, Standard and Emergency calls can be indicated via its buzzer and zonal LEDs. 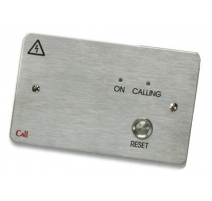 Two buttons are also provided to allow the user to Reset or Mute standard calls, as detailed below. STANDARD CALLS: when triggered by a calling device, the Controller’s internal buzzer sounds continuously and the relevant zone indicator(s) illuminate steady. Pressing the Controller’s Reset Button, if enabled, cancels all standard calls. Pressing the Controller’s Mute Button, if enabled, silences the Controller’s internal buzzer. 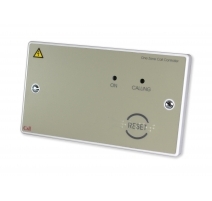 However, if a new call (standard or emergency) is triggered anywhere on the system, the buzzer will resound. EMERGENCY CALLS: when triggered by a calling device, the Controller’s internal buzzer pulses and the relevant zone indicator(s) flash. This level of call takes priority over standard calls and cannot be muted, accepted or reset at the Controller. An emergency call can only be reset at the device from which it was triggered or via a reset point, wired on the same zone.